6//2010 : Uploaded this entry from my Bellsouth Personal Art Diary. This plant stand is still quite functional, albeit ugly, out in the yard. I told Beau he could get rid of it if he wanted, but it appears he still finds it a great plant stand. Created base for Bowling Ball stand. Took 1 tomatoe form and cut off spike ends. Measured for, and cut, three sections of 1/4" styrofoam. Tapped the styrofoam to outsides of tomatoe stake using duct tape. 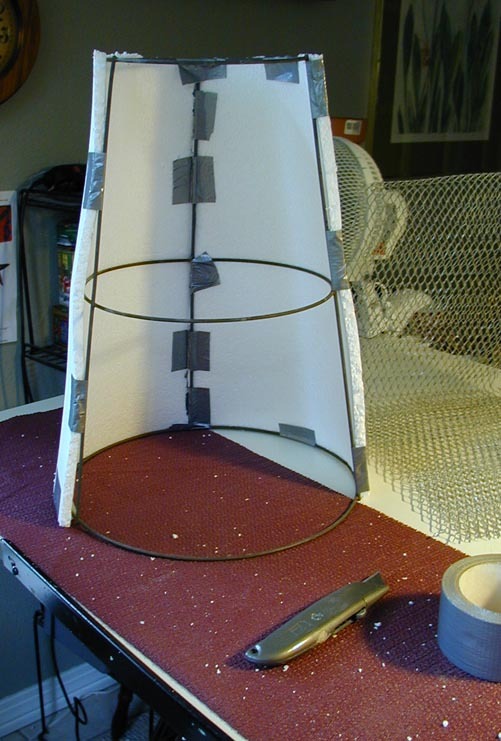 Cut stucco mesh and wrapped (in sections) around the styrofoam form. Tied the individual pieces of stucco mesh together with small wire to ensure it lays flat against the styrofoam. Made concrete 'dry' mix in bucket (3 parts sand; 3 parts grout; 2 parts cement). Mixed small batches of concrete (2 garden scoops at a time ... have an approx. 20 minute window to work with damp concrete). Made small patties with hamburger and pressed through stucco mesh ... covered untire base. Applied a second layer of 'patty' concrete to even out the valleys. Smoothed sides with hands and spoon. Pressed in 1" pieces of mirror tiles, green glass gems and aquarium gravel for decoration. Covered with plastic and left overnight. (Note: Misted with a spray bottle half dozen times to keep moist). Whole process took about 4 hours. Unwrapped plant stand. Two glass gems and fallen off; reapplied with thin set morter. Cleaned glass gems and mirror tiles with warm water. Used rasp to smooth edges at bottom. Used a butter knife to pull out the styrofoam from inside. Took outside, sprayed thoroughly with a hose and rewrapped in plastic. Set in corner of yard to cure of several weeks.